* In order to maximize playing time, class size is limited to 10 participants. Therefore, the same workshop is being offered twice on Nov. 10th. ​or the equivalent from another comedy school. The afternoon workshop is now full. There's still room in the morning workshop. Or you can sign onto the waitlist below. SAME WORKSHOP! SMALLER CLASS SIZE! MORE PLAY TIME TWO TIMES! Come learn the improv magic behind HVC's most popular show, SCRIPTED/UNSCRIPTED, from two highly experienced performers (and all-around awesome people). In this structure, an actor performs one half of a scene strictly line by line according to a script while the improviser has no idea what scene it is and gets to make it all up on the spot. SCRIPTED/UNSCRIPTED is a wild and wooly ride that can be surprisingly, magically ease-ful for improvisers. 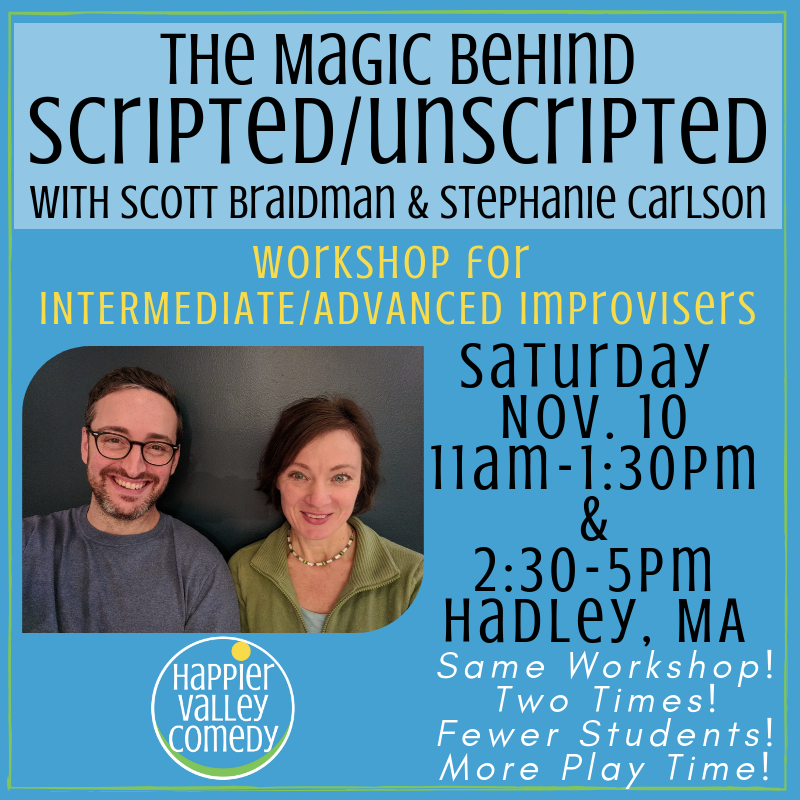 Scott Braidman leads you through an exploration of the joy and ease of holding up the improviser's unscripted half of the scene while Stephanie Carlson provides insight on the scripted actor's half of your scenes. And you'll get to improvise while Stephanie performs the scene line by line with you. You get to practice SCRIPTED/UNSCRIPTED with Stephanie Carlson! How cool is that?! Spend the afternoon getting a hands-on feel for the artistry and craft of improvising in this structure. Then you'll get to see Scott and Stephanie perform in SCRIPTED/UNSCRIPTED that night. How cool is that too?! Prerequisite: Completion of Zen of Improv 3 or the equivalent from another comedy school. NOTE: The same workshop is being taught at both 11am and 2:30pm. It's now 2.5 hours long and limited to no more than 10 students to provide more playing time. Scott Braidman is General Manager and Artistic Director of Happier Valley Comedy. Scott started improvising 15 years ago with Mission: Improvable at UMass Amherst, and since then he has studied and performed at The iO Theater and One Group Mind in Chicago, The UCB Theatre in New York, and ImprovBoston and Improv Asylum in Boston. He was also an instructor with the ImprovBoston Comedy School. Scott produces all of Happier Valley Comedy's shows as well as teaching Advanced Improv classes and performing with The Happier Valley Comedy Show, The Happier FAMILY Comedy Show, The Majesters, and the tiny audience show We Made A Thing. However, his 3-year old Amelia will always be funnier than him.